If you want to understand photography, all you have to do is to go online and look at how people use it. This means you will have to see past what the pictures look like, whether, in other words, they are any good or not. We all know well what a good picture looks like (for us – this is all mostly subjective), but we don’t know nearly as well what these pictures do that we deem good or bad. Having written about this for a while now, I’ll admit that fatigue has set in at this keyboard: there are only so many times that you want to write an article about picture “manipulation” and photojournalism, say, before you realize that it’s futile for more reasons than one. For a start, people love sticking with absurd ideas about what photographs are and what constitutes “manipulation”. But even worse is the fact that people love pretending that the use of photographs has nothing to do with how they are perceived when in fact it’s the complete opposite: photographs have almost no meanings without them being used for something (whatever that something might be). Seen that way, what I wrote in the beginning only is the logical consequence: to a large extent photographs need to be judged not only through their form and content (which, mind you, are important enough), but also through how and where they are being used. Photographs can become good or bad through their use. Good photographs can become bad, or bad photographs can become good once the viewer understands what is at stake. A variant of this argument is provided by The Encyclopedia of Kurt Caviezel. If the press text is to be believed, “from his studio in Zurich, Kurt Caviezel has been monitoring 15,000 publicly accessible webcams located all over the world.” It makes me shudder to think about going through 15, let alone 15,000 webcams, to look for what might present itself. But then, I’m doing the exact same thing on a large variety of Tumblrs and Instagram accounts. So maybe I’m just as obsessed. Regardless, Caviezel compiled “an archive of more than 3 million images, categorizing them for recurring patterns and subjects,” and the book is the result of this endeavour. What it does is straightforward: there is a large list of entries, starting with “airport,” and then continuing through obvious (“bus stop”) and not obvious (“C.D. Friedrich”) ones, to finally arrive at “zoo.” For each entry, there are webcam pictures. 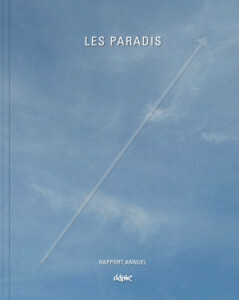 The viewer gets 38 images of airports, say. “Costa Concordia” only contains images from one source, but the collection shows the salvage operation of the stricken ship in time. In its simplicity and maybe degree of obviousness, The Encyclopedia of Kurt Caviezel might strike especially those embedded in academic forms of photography (curators or photography academics) as not worthy of much, if any, attention. But much like maligning the selfie as merely being an embodiment of narcissism, this would be a grave mistake (not that academics won’t happily make mistakes, while attempting to masquerade their ignorance with high-falutin jargon). The book makes a more complex use of how the use of photography determines their meaning than one might realize at first, given that webcams are usually used for evidentiary, not encyclopedic purposes (they are in effect publicly available surveillance cameras). There is much to be said for a better, meaning: more profound engagement with those forms of photography that aren’t fully accepted into the canon. Ultimately, the selfie is to photography today what colour photography was for “art photography” before John Szarkowski busted that silly barrier down with his William Eggleston exhibition at MoMA. The usual argument that “there are too many pictures” today, and they’re all bad (or whatever you’ll hear from bored photographers who prefer to think of themselves as “artists”) holds no water for a large variety of reasons. For a start, if your imagination is so poor that the presence of all those photographs will prevent you from taking pictures, maybe you should look for another way to spend your time. And as The Encyclopedia of Kurt Caviezel demonstrates, to deny oneself of the sheer enjoyment that can be had so easily from engaging with the crazy world of photography generated by essentially all of us strikes me as, well, nuts. If you just start looking at what you can see in pictures, and what people do with them these days, you will be amazed. You don’t really have to read the news to find out whether the stock market is tanking or not. You just need to look whether or not there are the usual photographs of distraught looking traders in the news. In much the same fashion, you can tell it’s election season in the US when you see photos of politicians pointing at people, or you see them giving speeches without a tie, their shirt sleeves rolled up. The media love a good cliché photograph. But when we think of the stock market, there is an underlying problem, namely the fact that what’s crashing cannot be photographed. All those transactions now happen inside computers, and many of the entities being traded are completely virtual anyway. A stock might have some value, which you could visualize as the equivalent amount of paper money. But futures or derivatives are entirely different beasts. In part this might be the reason why so little photography has been done around the causes of the recent Great Recession. It’s easy to photograph empty homes, say, and it’s easy to photograph people who just lost their home, but it’s a bit harder to photograph any of the root causes. How do you photograph, let alone understand, a subprime mortgage? How do you photograph greed? Of course, the fact that it’s difficult doesn’t mean it can’t be done. A brilliant case in point is provided by The Heavens, a photobook centering on tax havens (there’s a website dedicated to it as well). The book was made by photographers Paolo Woods and Gabriele Galimberti, in collaboration with Nicholas Shaxson who wrote an in-depth essay that gives the insight photographs simply cannot produce. The photographs in The Heavens center mostly on some of the players, plus on what one could think of the symptoms. There are images of very wealthy people, of, let’s say, post-office boxes on the Cayman islands, of buildings built but never occupied, there even is a photograph of an art collector who just bought a painting (reminding the world of art photography that it is not entirely innocent here). For every such image, an accompanying caption provides information of what the viewer is looking at (and why this actually matters). Combined with Shaxson’s essay and a series of smart and engaging infographics, the photographs become part of a larger whole that demonstrates that photography can indeed cover complex topics, topics that don’t lend themselves to easy (or cliché) pictures. As a book, The Heavens shows how and why documentary photography can still play a vital role, especially once it utilizes all the tricks that can be employed in book form. And we do need to see work like this, for all the reasons that I outlined above — unless, of course, we’d rather not look and know where some of the money is coming from that is being funneled into the art world, where and how corporations hide their money so they don’t have to pay taxes for the services that we would like to enjoy, what kind of shadow world exists in plain view, a shadow world that time and again has severe repercussions for our own lives, whether it’s a crashing stock market, or interest rates going up or down etc. One of photography’s most glaring weaknesses can be its strength at the same time: it’s just so unbelievably straight. There’s this thing or situation, you point your camera at it, press the shutter button, and that’s the picture then, of that thing or situation. Daniel Stier makes good use of this mechanism in Ways of Knowing, a two-part publication that combines images taken in a variety of scientific environments with an assortment of essentially New Formalism-esque still lifes. As much as I’m infinitely tired of the mostly lame tropes of New Formalism, in the context of this particular book they actually make sense. 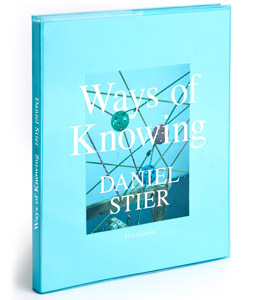 Where most New Formalism work centers on its own navel, lacking any sense of a world outside of the narrow confines of institutional photography, Stier’s pictures make use of exactly that: they’re being embedded into the context of the human quest to make sense of the world. They thus gain a faux relevance that undermines their pictorial seriousness, much like the deadpan photographs of people strapped into absurd-looking contraptions for the sake of scientific research that are shown in the other part. Ways of Knowing isn’t as visually subversive as Andreas Meichsner‘s The Beauty of Serious Work. Instead, it’s serious and free of a sense of irony, let alone snark. But the book pulls it off regardless, in part because in this day and age, the serious often cannot run from the absurd. As insightful as the photographed situations in the scientific labs might be for their maker scientists, beyond that room things are just, well, absurd. Whether it was a good idea to keep these two sets of photographs separate I don’t know. It was an obvious solution, for sure. Things are being made easy for the viewer. But I did find myself looking at the laboratory photographs at an increasing pace, given that seeing one after another after another etc. does get a bit, well, repetitive. So I probably would have preferred a single book, with these photographs intermixed. Of course, I’ve got to review the book I got, not the one I’d want. But I do think the one I’d want would be slightly better. I noted above how the media love a good cliché photograph. Needless to say, you might disagree. How can news photography possibly be clichéd if the events they depict have never happened before and are unlikely to happen again? This is where we could start talking about form and content, about what a photograph describes in a visual manner and how it does that. David Shields has just done that job, the job of looking at pictures, specifically war photographs used on the front page of The New York Times, classifying them not according to what they show, but how they do it. 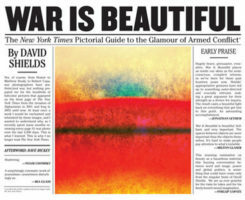 The result is War Is Beautiful, whose subtitle The New York Times Pictorial Guide to the Glamour of Armed Conflict gives you an idea of what to expect. I’m sure you wouldn’t necessarily expect to see war portrayed in a glamourous way on the front page of what is widely seen as the United States’ most relevant newspaper. Can there be such a thing, especially given the photographs in question were taken by a wide selection of photojournalism’s finest practitioners? The answer is not only affirmative, it is also deeply troubling, given the consequences. The photographs in War Is Beautiful all center on the wars in Afghanistan and Iraq (in the latter case, the newspaper played a considerable role in the country’s rush to war). Shields organized them around themes or topics, in part based on what they show, in part based on how they do it. Seen in these categories, the viewer is in for a shock. What at first might look like almost bizarre categories — “Nature” or “Playground” or “Beauty” — quickly make a lot of sense. And organized this way, the selection mechanisms that made these particular photographs front-page worthy indeed is being revealed. Given we love to ignore the many different invisible hands that handle photographs before we see them in the media, War Is Beautiful shows us what those hands do. They show us what many photographers know, namely that it’s one thing to bring the pictures, but it’s quite another to get them published, especially if what is depicted (or how it is depicted) won’t sit well with those who do the publishing. While the book singles out The New York Times, making it clear how the paper is anything but the disinterested entity it loves to pretend it is, the same exercise could be done for many other news organizations. Photographs don’t come with meanings, we give them meaning through their use. For us to be better “consumers” of the visual diet we are being served, we need to acquire the skills that Shields displays here. 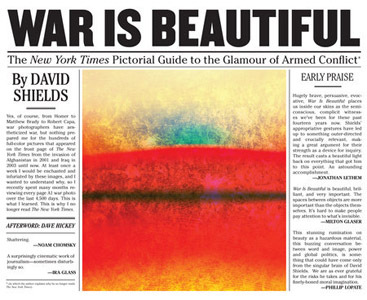 For any visual-literacy class, War Is Beautiful could serve as a textbook. And those not going to school any longer might still want to have a peek.